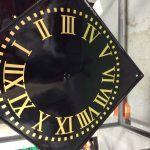 The Antiquarian Horological Society’s Turret Clock Group have been working for some years on a database. This will provide a unique research tool and make a huge contribution to the conservation of our turret clock heritage. It already holds around 4000 records thanks to a few dedicated and generous souls. But the next big step requires the inputting of large amounts of existing data, covering thousands of clocks. This can only be done with some paid assistance, costing in the region of £3000, which is beyond the scope of the group’s resources. The Council of the Antiquarian Horological Society is backing the project with the promise of matched funds. Given our father Nick Smith’s profound commitment to Britain’s turret clock heritage we feel it is apt that we support this work in his memory. In his later years he served as both President and Archivist of the company, and responded to numerous queries by delving into our own archives. Hence we are donating £500 and encourage others who care about ‘the future of the horological past’ to do the same. In similar vein we will also be remembering him by supporting a book project by one of our team (more on that in due course). 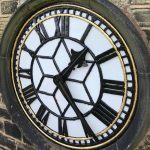 The simplest way to make your donation is to make a direct online payment to AHS Turret Clock Group; Barclays Account number 60100218; Sort Code 20-94-48. Paypal is quick and easy. Send your donation to ahsturret@gmail.com. If you prefer the old-fashioned way, please send a cheque made out to AHS Turret Clock Group to Nigel Platt, 14 Somerton Close, Bedford, MK41 8HA.Note that the AHS will be able to make a gift aid claim to increase the amount of your donation, if you have already made a gift aid declaration in connection with your annual subscription to the AHS. To enable the Group to receive matching funds from the AHS Council and have the database fully entered up with all of the backlog of historical data by the beginning of 2019, they need to receive donations by the end of October.